Printmaking is a process of making art by creating designs or pictures on plates or blocks which are then used to produce multiple images. There are many ways to make prints. 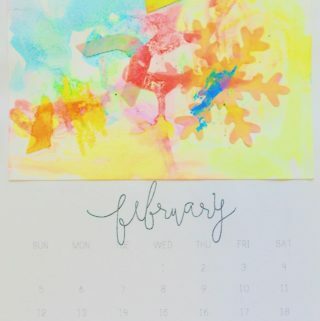 One of the simplest and most playful, open ended techniques is potato printing. 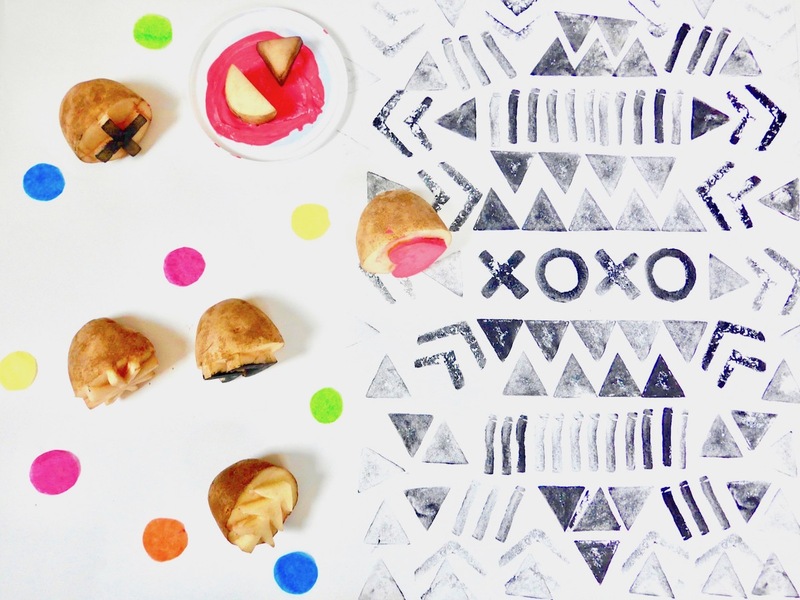 A few potatoes will guarantee hours of exploration, encourage play with patterns, layering colors and not only young children will enjoy making marks. 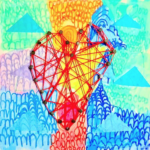 There is lots of room for variation and you can create true works of art – perfect for a Valentines themed project. Cut a potato in half and carefully etch your desired shape into it. You can use a pencil to draw on your shape first. Cut away around the outside of the potato to reveal the shape which should be about 1/2 inch deep, let dry for 5min. 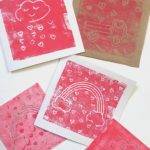 If working with children show each step of the printmaking process before printing. Pour some paint into a tray, one for each child. To avoid too many colors turning into brown limit your colors to one or two choices. Set out your precut potato and invite each child to choose one stamp. Dip your potato stamp into the paint and move it around. 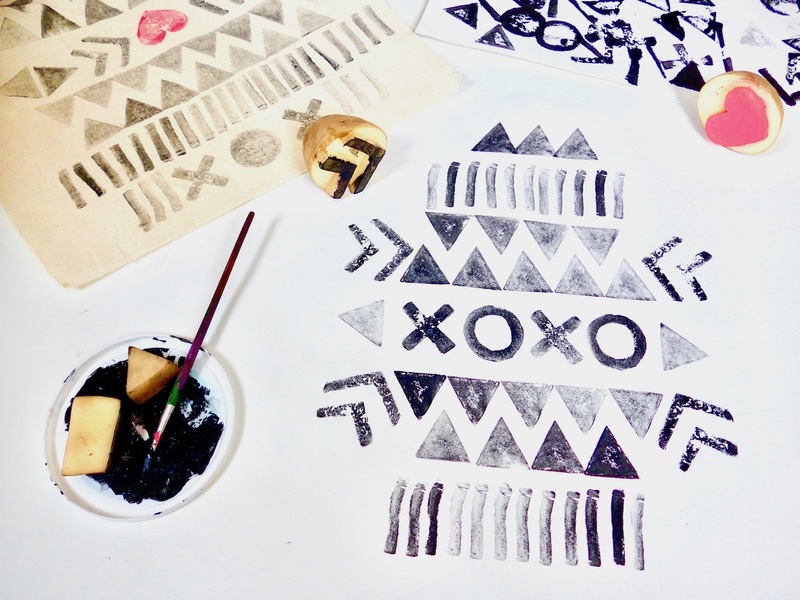 For a more even look use a paintbrush to paint your stamp. Use a paper towel to wipe off any excess paint on the sides. Test your print on a separate paper and blot off any excess paint before firmly pressing your stamp onto your paper to print. 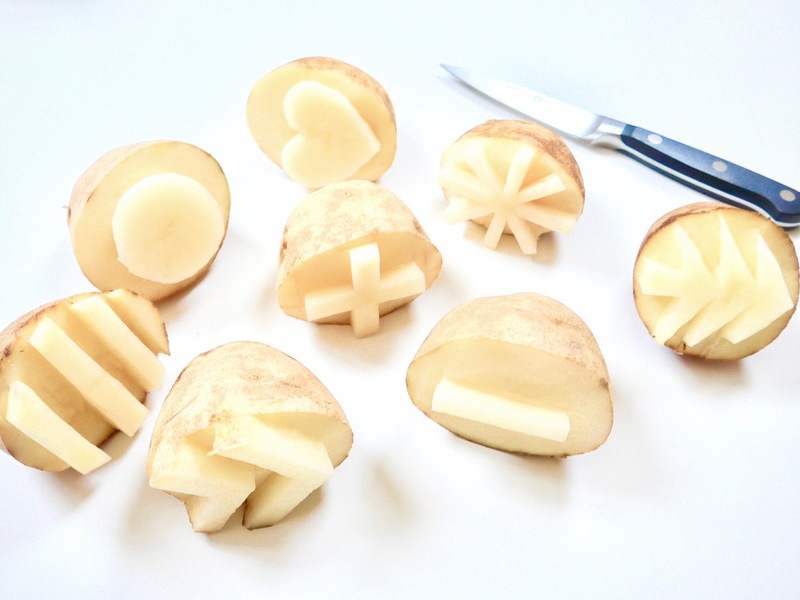 Encourage children to use different potato stamps. Remind them to put the potato stamp they’re done using back to the others before taking a new one. While printing experiment with repeating different patterns, fading shapes and layering shapes. Ask your children about different shapes and colors they are using. Point out when they create a pattern. You can create alongside with them. Once you have mastered this technique try your potato stamps on different surfaces, like packing paper, fabric or canvas fabric. Use a different potato stamp for each color or rinse it off before using it with another color. When you are finished stamping cut your paper or fabric to the desired size. 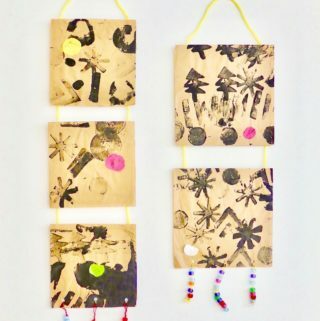 Once dry you can invite the children to decorate and collage on their paper or fabric. Set out containers with choices of colorful stickers, cut tissue paper shapes or construction paper shapes. 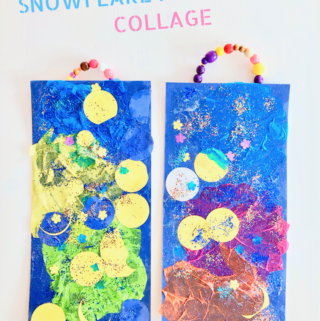 Show how to glue a dot the size of the chosen shape onto paper and press the shape onto it (I use purple glue sticks that dry white so the children can see where on the paper they are glueing). Hot glue a wooden dowel onto the front top and bottom of your paper or fabric. 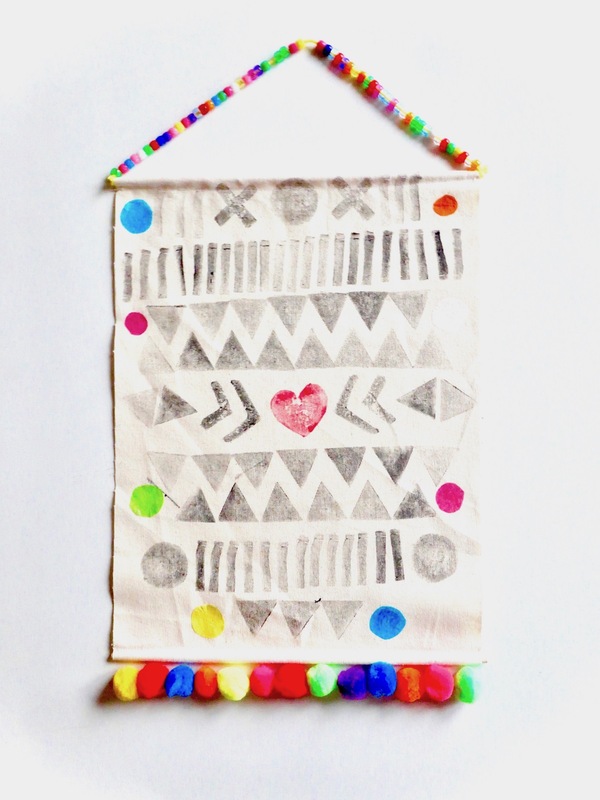 Attach a string to create a hanger. Most children love adding beads. 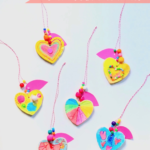 Use a wire instead of a string since it is easier to thread the beads onto. Hot glue pompoms to the bottom.